Using public transport is not everyone’s idea of an enjoyable holiday. However for the more adventurous traveller using the bus services is both economical and exciting! A fantastic way to see the island! 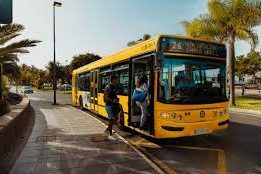 There are two companies that operate bus services on Gran Canaria, these are Global and Guaguas Municipales. They are very reliable, comfortable, and relatively cheap to use. They run 24/7 to nearly every popular area of Gran Canaria. As mentioned most of the buses meet a high standard of luxury having air conditioning during the hot Summer months. The blue buses are operated by the company Global. You can plan your trip using these buses to take you anywhere on the island. The other bus company is called Guaguas Municipales, these are yellow buses. However these generally only run a service in the capital of Las Palmas. Both companies work together in conjuction so you can easily combine the use of both blue and yellow buses to get to your destination. You can buy any ticket as you enter the bus, just tell the driver your destination. They are very helpful in assisting you with direction. However to save money and get some discount as it is possible to buy a card online. Paying on the bus in cash is always possible but be aware that not always the exact change can be given. It is preferable to you have the exact amount for the fare in coins. Buying your pass online is cheaper usually giving you a 20% discount on the usual fare. It is called the AB bus pass and is only valid on that route indicated on the map. There is the TRANSGC card. This is a excellent option if you are going to use many buses to get around the island and it can work out very cheap indeed. However you have to to pre-order this card at the company Global by visiting the global website. It is best to order this card when at home a few weeks before you leave for Gran Canaria. You can download the application form, then email it back to Global. Remember to add a photograph. You will then be able to collect the card at the bus station San Telmo in Las Palmas. You should allow about 10 days for your application to be processed from the time of booking. The good thing is this card itself is free, just reloading must be paid with a minimum amount of € 15. Pensioners and students are in for a treat as they receive an additional 20% discount. Families of at least four children also enjoy an additional discount. When you get on the bus it a passenger has to scan their card and you must then remember to scan it again when you get off the bus. Then the correct amount will be charged on your TRANSGC card. The good thing is if you do not have enough funds loaded on the card when you leave the bus, the deficit will be deducted the next time you top up the card. Note: At the beginning of 2018 Dogs, cats, ferrets and birds can now travel on Global buses. They must be in good hygienic and physical conditions. Only one pet per person allowed. Pets must be on the knee of the person in a transport waterproof base box/carrier not exceeding 60cm x 35cm x 35cm. Other items are allowed as long as they do not disturb or cause problems for the other passengers. Large items are usually allowed but must be stored under the under carriage. The bus stop is located across from the main terminal building and is very close by. Global Bus offer direct bus transfers to Las Palmas from the Gran Canaria airport. Also heading South to Mogan stopping along the way to the major resorts and towns. This bus company has an extensive network in the capital Las Palmas. They have around 40 bus routes with some routes operating 24/7 even at night. With so many buses operating you never have to wait long to get you around the city. The frequency of the bus schedule is divided in to colours to help passengers navigate the network. On that particular route. Red signifies a high frequency and they depart from the port of Las Palmas. Whereas a dark blue operate only during the night. Single Ticket: You can buy any ticket as you enter the bus, just tell the driver your destination. They are very helpful in assisting you with direction. Try to have the correct change. The fare is € 1.40 for one journey. Return Ticket: There is a Bono-2 ticket that allows you to make two journeys. Either a return journey or to use on a different bus route. You cannot buy the Bono-2 ticket on the bus. Therefore you need to purchase it in the local shops or bus stations such as Santa Catalina or San Telmo. The card costs € 2.40 giving you some discount. Yellow Ticket: There is also another money saving option that is highly recommended if you are staying in Las Palmas. This is a Bono Guagua sin Contacto. It is a yellow electronic card that allows you to make 10 trips on Guaguas Municipales. Again you can purchase this pass at the local shops or bus stations. There is a small fee of €1.50 to first buy the card then the minimum cost is € 8.50 (10 bus rides). You can reload the card after the 10 bus journeys for another €8.50. To use the card you have to scan the card at the start of your bus tip and when you get off the bus. Blue Ticket: For those not using the bus service too frequently there is a very similar Bono Bus card. This is a blue card, instead of yellow. The card is the same price €8.50 for 10 rides but cannot be topped up or reloaded with credit. Those tavelling on buses with special needs. Persons with disabilities and use in a wheelchair must park themselves in the opposite direction when on the bus. If you inform the bus driver for assistance they can provide you with direction and support. Buses allow a child’s pushchair or buggy. If the child is in the buggy then they have to be strapped in securely. Therefore, it may be better to put the pram in the luggage compartment and take the child on your lap. If needed there are secure places for pushchairs on the buses.